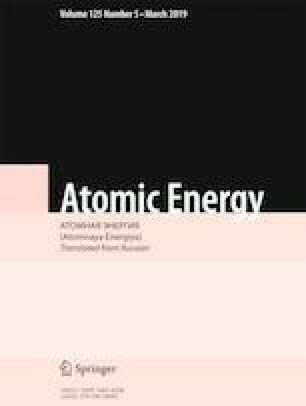 The realization of the residual life of nuclear fuel upon decommissioning of a RBMK type channel reactor is studied. A mathematical model of the energy-production spectrum of FA is presented. Two methods of decommissioning a reactor depending on the method of criticality conservation are compared. The first possible method of conserving the criticality of a reactor upon commissioning is extraction of the FA with high energy production and the second is formation of a two-zone load: fresh FA are placed at the center and spent FA at the periphery. The second method gives a greater advantage in terms of power and remaining energy-production life. The results were obtained in a point model of the dynamics of the FA spectrum in a linear fit to the FA power and multiplication coefficient versus energy production and attest the fundamental possibility of optimizing fuel use and decommissioning of a RBMK reactor. Translated from Atomnaya Énergiya, Vol. 125, No. 5, pp. 255–258, November, 2018.